Our ‘Country Club,’ Tis of Thee? In Evenwel, two plaintiffs from Texas scouted by Blum asked the Supreme Court to re-interpret fundamental principles of our democracy by drawing lines based on voters only, and making invisible millions of our family, friends, and neighbors who are not voters. Lately, Ed Blum’s name has been everywhere. At least, when it comes to Supreme Court cases. Whether it is affirmative action, voting rights, or redistricting, Blum has been leading a well-funded effort to limit who has representation in our democracy. From our schools to our state legislatures, Blum pushes a country club credo – membership in these institutions should be exclusive and should be limited to people who look like him. He describes himself as a match-maker – just someone who believes in certain causes who connects potential plaintiffs with high-priced law firms and a media engine to get cases into the very slim docket of the Supreme Court. The most recent case to make through that narrow aperture was Evenwel v. Abbott, a decision released by the Supreme Court on April 4, 2016. As the Framers of the Constitution and the Fourteenth Amendment comprehended, representatives serve all residents, not just those eligible or registered to vote. Nonvoters have an important stake in many policy debates — children, their parents, even their grandparents, for example, have a stake in a strong public-education system — and in receiving constituent services, such as help navigating public-benefits bureaucracies. By ensuring that each representative is subject to requests and suggestions from the same number of constituents, total population apportionment promotes equitable and effective representation. There can be no truer principle than this—that every individual of the community at large has an equal right to the protection of government. 1 Records of the Federal Convention of 1787, p. 473 (M. Farrand ed. 1911). (Really, I mention Alexander Hamilton because my colleague, Dan Vicuña, is obsessed with the 2016 Grammy-award winning rap-musical hit and powdered wigs). The Supreme Court recognized the common practice of states to use the Census Bureau’s full count of each state’s population. In 2020, the Census Bureau will conduct a count of every American – where they live, how many people are in a household, basic demographic information about them – just as they have done each decade before. Historically, this Census data is critical in allocating the number of Congressional representatives to each state (when a state’s population increases, it can mean more representatives in the House of Representatives, and when the population does not grown or shrinks, it can mean fewer). The Census count is also what we use to redraw Congressional districts to ensure each district within a state has equal population. 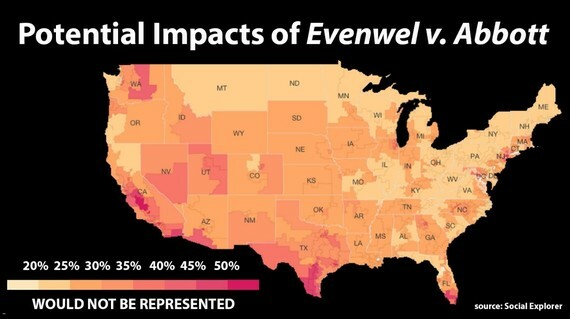 The fight in Evenwel was over whether states could use these same numbers to redraw the lines for the state legislative districts. In reviewing the redistricting history of our country from the early days of the Founding Fathers until now, the Supreme Court said, well, of course states can. The Court unanimously held that states may use Census data counting total population to draw state districts. It would create an indefensible situation in which states would be required by Article I, Section 2 to use total population as the basis for the redistricting of congressional districts, but be prohibited by the Equal Protection Clause from using the same standard when redistricting state legislative districts. Finally, it would break the structural link between the right of every person to equal protection under the laws enacted by the state legislature and the right of every person subject to those laws to equal representation in the houses of that legislature. We don’t know what Ed Blum has up his sleeve next. But we have to keep a close eye on efforts in states with a recent history of voter suppression to push legislation to exclude people from being counted for redistricting. We know that those who would to try to tilt the scales to give one party or certain incumbents a political advantage would love to exclude children and young people under 18 years of age, new Americans, and others from having political representation. From Los Angeles to Salt Lake City to Atlanta, these large and small communities across America spoke with one voice – it is not right to erase millions of people from our democracy. As Pete Buttigieg, mayor of South Bend, Indiana reminded us, the political implications are significant – erasing millions of residents from the political map means rendering towns and cities voiceless in state legislatures. Even though the decision in Evenwel should give us some relief, the reality is that it’s unlikely that Blum or his secret donors have given up the fight to exclude people from our democracy. Here at Common Cause, we are asking folks to write to their Governors – tell them our Constitution protects all of us, not just the exclusive few who belong to Blum’s country club vision America.